Factory view is basically finished so now it's time to work on the Mine and Warehouse interfaces. This is the proposed Mine interface. I would appreciate some feedback on this. Note that I have a 'trucks' section that's currently blank. I'm not sure how the trucking is going to work exactly in the game, probably just a case of statistics (we've discussed how mines/smelters will automatically set up trucking routes with the user's involvement basically being to ensure that enough trucks are provided per route). Side note -- under Smelters, the "Tapped Out" button doesn't make sense... consider it a copy/paste whoopsie. So here's Revision 2 of the Master Mine Operations View. Since v0.8.0 is going to focus on resource management and in particular, truck routing, I opted to have this view focus on primary mine operations and the truck routing. It still feels like something is missing but this is the general idea I'm going to be going for. The site map is included to provide a visual cue of distance. When the user clicks on other Smelters, they will be presented with information regarding distance, efficiency of the trip (e.g., route time calculated based on the tiles present in the route) and whether or not a route can even be found (on some maps without bulldozing impassable terrain can potentially divide sections of a map). Should those check boxes for the resource types all be unchecked, or should they all be checked? I'm looking at the check boxes and thinking this is a non-operational mine. Though the list box appears to be highlighting the operational mine. I'm also a little uncertain how checking some combination of the boxes affects how resources are extracted. That makes use slightly unintuitive. The UI looks pretty enough. Hooman, I may be wrong but if the check boxes are all open on an operational mine, I believe that the mine production isn't focused on any one resource type. I can see your point, though. 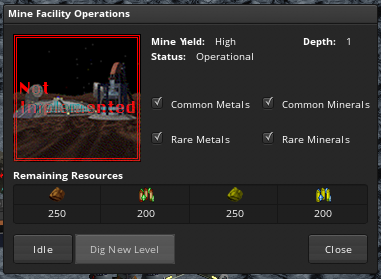 If the mine is unrestricted in production, maybe all of the boxes should be checked, with the option to uncheck if you are running heavy on one resource type. Leeor, could use a clarification here, please. This is a mockup, the checkboxes being checked or not is irrelevant. They would behave the same way as the non-fullscreen UI where what's checked is what's being mined and what's unchecked is 'paused'. This is sounding antagonistic and it's not intended. Just somewhat at a loss for words so please forgive the brevity. Got it. Thanks for the correction. Not sounding antagonistic at all. Something that just came to mind, so please tell me what you think. By having colony administration as part of the research tree, what do you think of making the mine checkboxes, truck routing, and the like being disabled until a certain level of administrative skills have been learned? Similar to making advanced structures available at certain thresholds. So, like with admin level 1 (start of the colony), the player can put down mines, build factories and robot commands, but the controls are absolute basic. Then as the levels increase, more options are made available. Is that getting too complicated or micromanaging too much? That's not a bad idea but may go too far into micromanagement. It would force the player to build ever more storage for mined resources that they may not need and could lead to colony collapse or force the player to scrap some refined resources to ensure they don't run out of another one that's more critical (this happens a lot with having too much refined Common Minerals but not enough Rare Metals leading to a very abrupt end of the game). Ahh, right, mock up. For some reason, I'm expecting a fully functional UI or something. That has yet to come. Need to get my hands in there and make it work.